For any additions/corrections to the Chaos page, please post here. Drakath is the Champion of Chaos and main antagonist of AdventureQuest Worlds. He arrived during the height of a Good versus Evil war and ended it by Chaorrupting King Alteon, and killing Sepulchure. 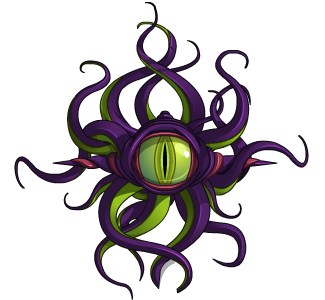 The Chaos Lords are hand-picked from Drakath to attack the world of Lore. They are chosen due to their powers and status in Lore. Some are grateful for the powers of Chaos given to them and immediately begin to serve Drakath, however, not all the Chaos Lords are willing to accept Chaos and attempt to fight it until Chaos ultimately takes over. Effect: Inverted the areas within Chiral Valley, often turning items and buildings upside down, also enabled mind control. Status: Deceased, killed by Drakath during his fight with the Hero. Note: Tribute to M. C. Escher. Objective: Help heroes choose the path of Chaos instead of their previous roles of Good and Evil. As the Chaos Twins, they aim to remove the Hero from ever existing by meddling in the Mirror Realm. Effect: Drakath's minions. They aimed two meteorites at Battleon, causing the heroes to teleport Battleon to its new destination of GreenGuard Forest. Chaorruptted Nythera and Lionfang. Drakath swapped Good Xang with Mirror Xang to make both the twins Chaotic. When the Good Xang used her powers to swap back with Mirror Xang, Evil Xing used her powers to merge herself with Good Xang to create Xiang. Status: Alive and Chaotic, roaming free around Lore. Effect: Enslaved the Dwarves to mine for Chaos Gemeralds. Status: Defeated and taken away by Stalagbite. Objective: To restore Yokai in his own vision. Effect: Stole the Hanzamune Dragon Koi Blade. Status: Defeated and lost in the Rift of Time. Objective: After being rejected by both the Vampires and Lycans, he wanted to become the dominant race of Darkovia. Effect: Chaorrupted Vampires and Lycans as well as created an army of Werepyres to take over Darkovia. Status: Defeated and became a pile of dust, however, the full moon showed signs of life. Status: Defeated and remains an ally of the player after being freed from Drakath's Chaotic tune and control. Note: Controlled a fake Chaos Lord, Discordia, to hide her Chaotic identity. Objective: Become the ultimate power, even if it meant disobeying Drakath. Effect: Closed the portal to the Para-Elemental Plane of Magic. Status: Defeated and became raw mana again with help from Drakath. Objective: To conquer the Djinn realm and world of Lore. Effect: Controlled by Zahart's ring until it was destroyed and he gained his own free will. Status: Defeated within the Djinn Realm. Objective: She absorbed Krellenos' Chaotic power to become the new Chaos Lord to take revenge on Drakath for causing pain and sorrow to Bloodtusk. Note: She replaced her brother, Krellenos, as the 9th Lord of Chaos. Objective: Leads the Hero to their destiny through AdventureQuest, DragonFable and MechQuest, and teach them the lessons of Chaos and Drakath before he becomes fully Chaorrupted. Status: Defeated and lost in time, however, it is hinted that he may still be alive. Objective: To act as a force of Good to defeat Evil and Chaos. Status: Defeated and fell down from the sky. It is unknown if he survived. Objective: Fight his growing chaorruption and keep his city safe, at all costs. Effect: Swordhaven was destroyed, left leader-less and in ruins. Status: Defeated by the Hero, currently deceased. Objective: Defeat Drakath and take his powers. Effect: Ravaged Lore, killed Safiria, unleashed the Queen of Monsters. Status: Lost chaos powers entering the Chaos Realm, and now currently roaming Lore. Aside from causing Chaos, a Chaos Lord's duty is to summon a Chaos Beast in order to unlock another part of the Chaos Gate in Drakath's realm. Once all 13 Chaos Beasts have been summoned, Drakath can unleash the Mother of Monsters.